The Tennessee Inventors Association has many creative, inventive members. Several of the TIA members could even be called serial inventors because they have so many ideas and patents. The following list identifies a few of the TIA members and provides information on their inventions. 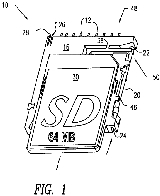 It also shows illustrations from their patents or published patent applications. If anyone is interested in obtaining additional information on any of these inventions, please contact the inventor or a TIA officer or board member. Many of these inventors are interested in licensing or selling their patents. Igor Alexeff, Oak Ridge, Tenn.
Igor is a physicist with numerous patents, including plasma antennas. Igor obtained 19 US patents. Joseph invented a boat that folds into a suitcase-sized shape. He has a patent titled "Boat foldable into a compact self-contained shape." AJ has a patent titled "Guided-vane rotary apparatus with improved vane-guiding means." Gordon has two patents. His first patent is intended to provide a non-audible alarm. Gordon is a teacher and his second patent invention is an aid for teachers in calculating grades. Evanton Solutions, LLC, was formed by inventors Susan Plauche and Holly Shaw, both of Knoxville, Tenn.
Susan and Holly have Patent Number 7,137,973 for Post tumescent liposuction absorption pad garments and are seeking a buyer or licensee for the patent. John Galkiewicz, Harrogate, TN: Kitty Tease. The Kitty Tease is a patented cat toy manufactured and sold by John. Joel is the inventor of 4 patents. Three are assigned to the United States, and the fourth is assigned to an ORNL contractor. Joe has invented a transmission jack that greatly aids in the removal and installation of automotive transmissions. Carl has invented a "Device for Improving a Golf Swing," which is patent pending. Many golfers, both amateur and professional, are constantly in search of a consistent and technically sound golf swing. One essential component of a technically sound golf swing is the shift of the golfer's body weight to the front foot during the golfer's down swing. The Pin High Pro is a training aid that helps golfers with their swing by giving feedback on when the golfer shifts his weight to his left foot. Rainer has numerous inventions, two of which have been patented. Both patents are for footwear, one for a force monitoring shoe and the other for diabetic persons. Martin Skinner, Harriman, TN: Koil Kaddy. The Koil Kaddy invention provides a convenient way to store coil-type garden hoses. Charlie and Travis invented a kit for performing a tracheostomy in emergency situations remote from a medical facility. Craig has invented and patented a walker that allows a helper to easily provide assistance to aid a person to stand from a seated position by using a walker with a lifting arm. The right angle ruler is the brain-child of Sandy, who was a math teacher. She developed her invention to aid her students in class. While working for Thomas & Betts, Steve invented a Mechanical Ejector for an SD Multimedia Connector.